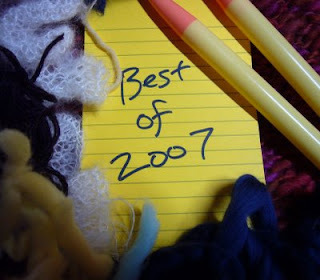 In honor of knit lit blog post, here's my Best of 2007 - feel free to do the same! the year you start one! 2. best FO of the year made by a blog you link to: probably anything done by the Rainey Sisters - they're amazing!! 4. best new book/mag/pattern of 2007 - I have to say that I don't love the magazines - they show lots of good girl patterns but the guy patterns are either silly or too cably for me... bookwise, my recent favs include the new Kaffe Fassett book... so inspiring! 6. top 5 inspirations--what five things inspired you the most over the past year? 3.) 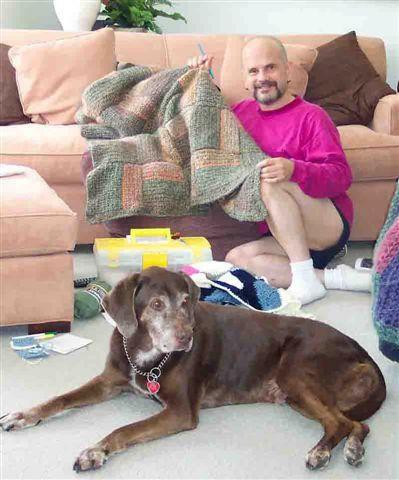 Simply Knitting in Santa Clarita Valley.... Karen is amazing and the people there make me feel so welcome. this LYS, even though it's kind of far from home is worth the drive, because of the way the people there make me feel. I appreciate feeling so at "home"
5.) All the blogs I read - I love google.com/reader - my friends on there inspire me - and knowing those people makes my life richer. 7. designer who most amazed & inspired you throughout the year - She's worth mentioning twice - Janice Rosema - so creative and positive - patient and talented... can't say enough about her! Happy New Year and I wanted to tell you that you were one of my inspirations of 2007. You inspired me to make my own blog header and I finally did it! Mine is simple but I like it. Cheers to you and I wish you all the best in 2008. Happy New Year. YOu had a great 07 and lots of fun awaits you in 2008. Thanks for sharing. Thanks adorable and talented one. It is such a great pleasure to know you and be able to play with yarn together. Happy knitting.